I’ve been sharing my spring decorating with you for almost two months now, if you can believe that! 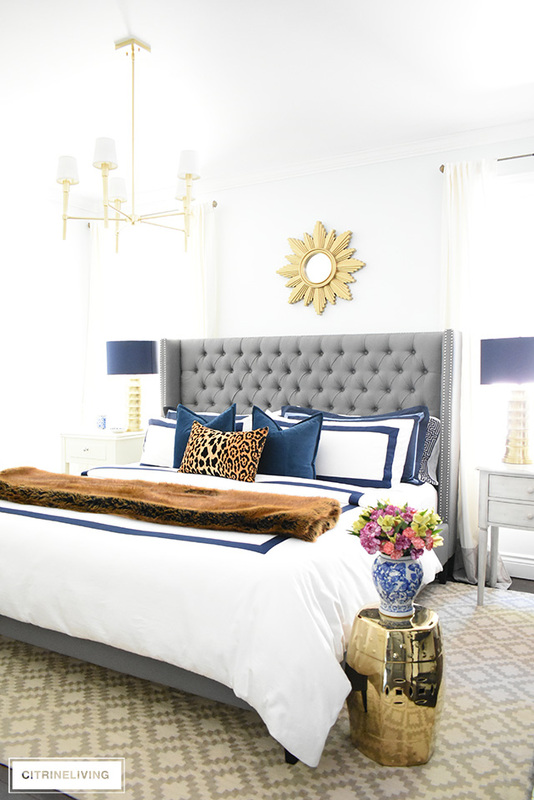 I started decorating for the season in February, with our master bedroom (read it here) – which got a few quick updates to lighten and brighten things up, and since then, I’ve been adding my finishing spring touches throughout our home. Although I’ve been in full spring mode, we still have snow outside! 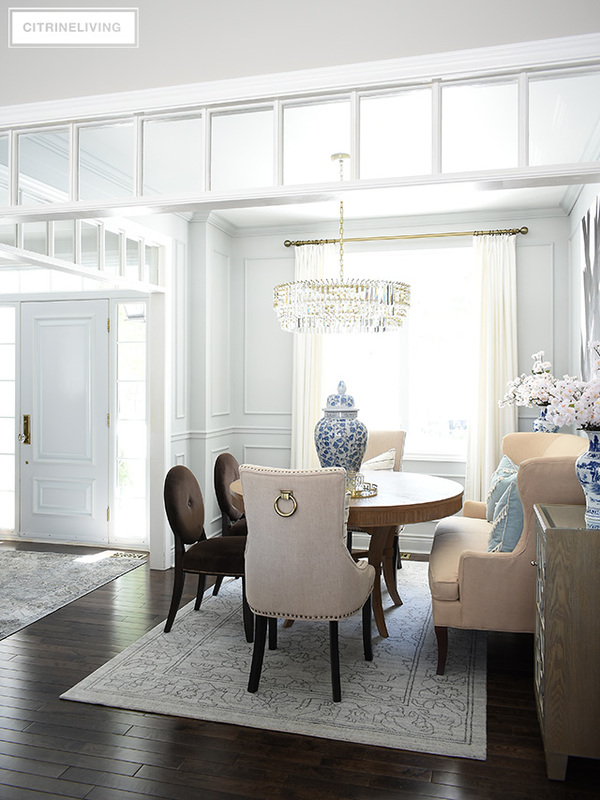 It’s finally starting to melt so I’m excited to be celebrating warm temps too :) I’m also very happy to be sharing my spring dining room decorating with you today – simple, quick decorating tips that help bring a light and airy look for spring. 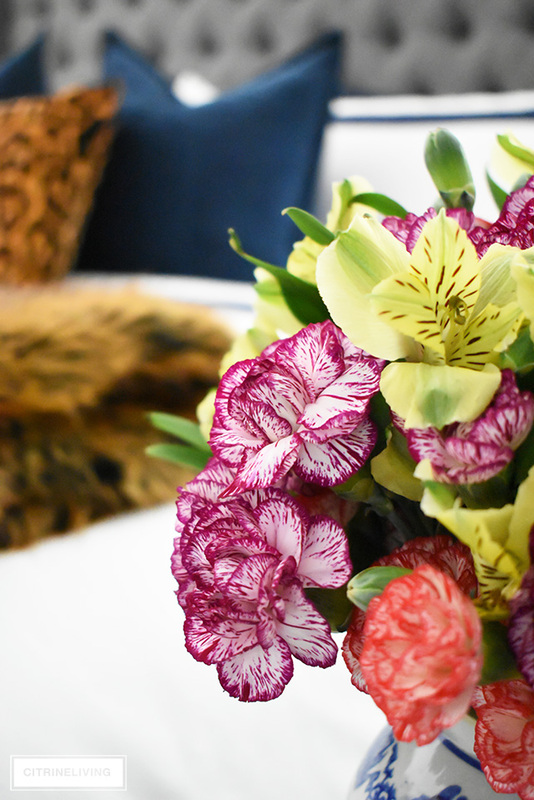 As a blogger, I’m always challenged with creative ways to update our home seasonally. I get many questions from readers, family and friends about how I go about making so many changes so often, and if it’s difficult to come up with new ideas. The answer is, yes, it can be, but I always try my best to keep things simple, so I don’t stress and it keeps my costs down as well. I did spend a little bit on a few seasonal accessories this spring – new pillows and faux florals mostly. The rest of my spring decor I’m using, are pieces I that move around our home and are on constant rotation. 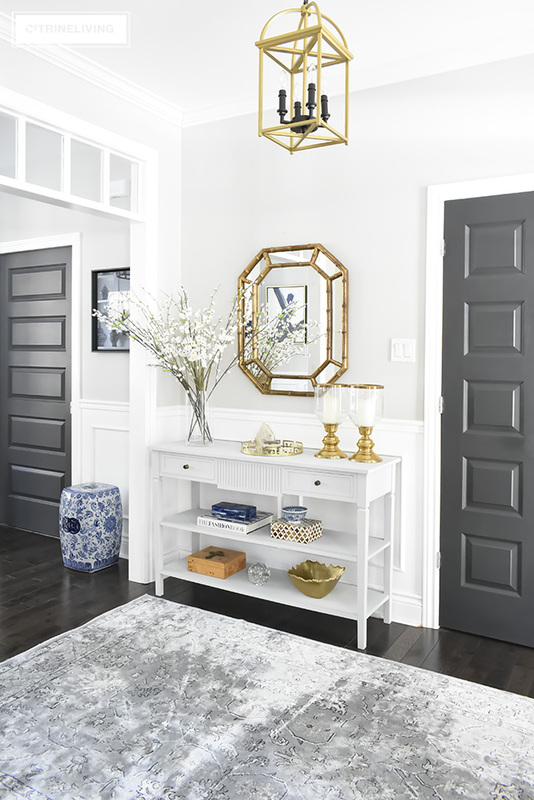 Did you read my spring entryway post? 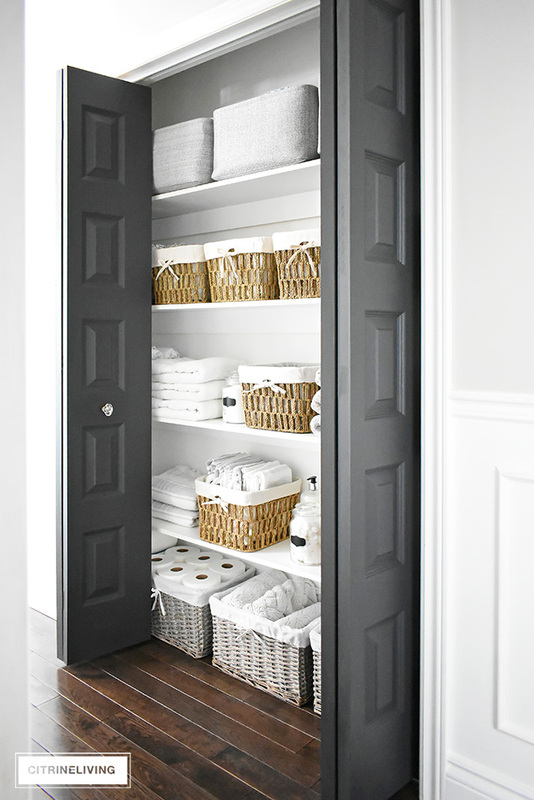 It’s also about simple decorating ideas you can use – read it here! Today’s post is about very simple decorating as well. I’ll be very honest – I didn’t even do that much new decorating in here, except add a few key touches. Literally. 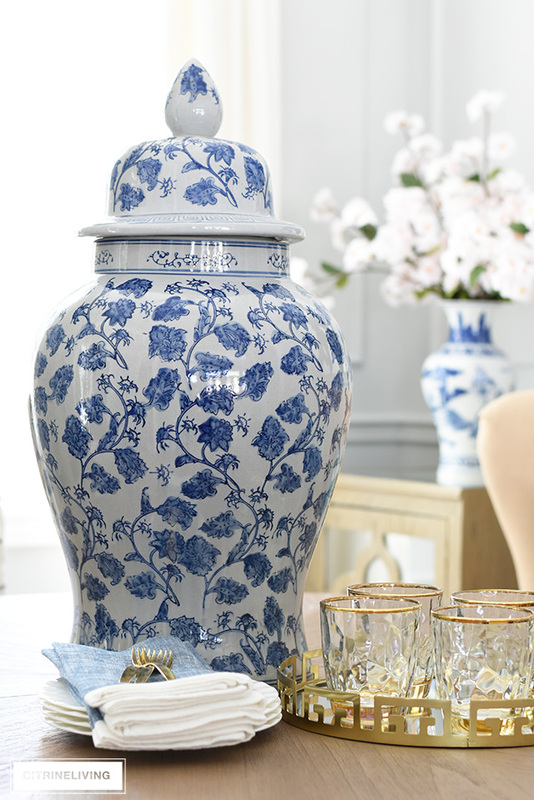 A pair of blue and white vases, some faux blossoms, and my large-scale ginger jar. C’est tout (that’s French for that’s all!). 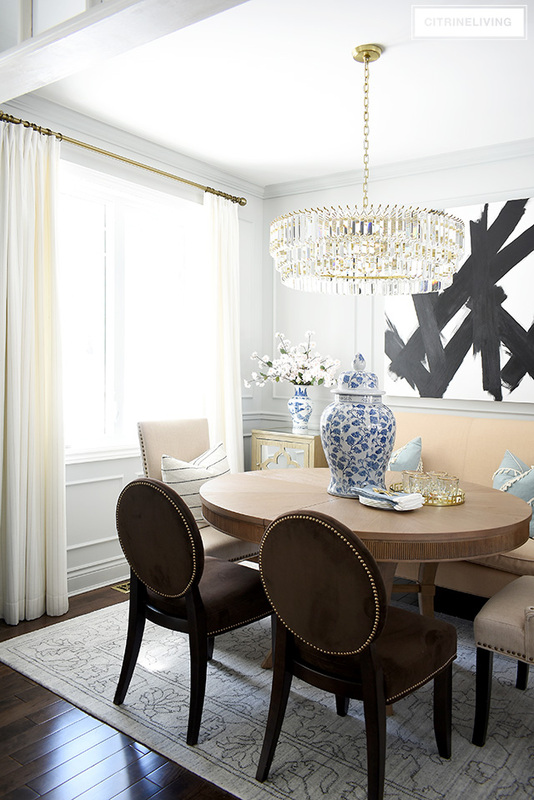 These few additional pieces add color, texture, and a lightness to this space that I am loving right now. 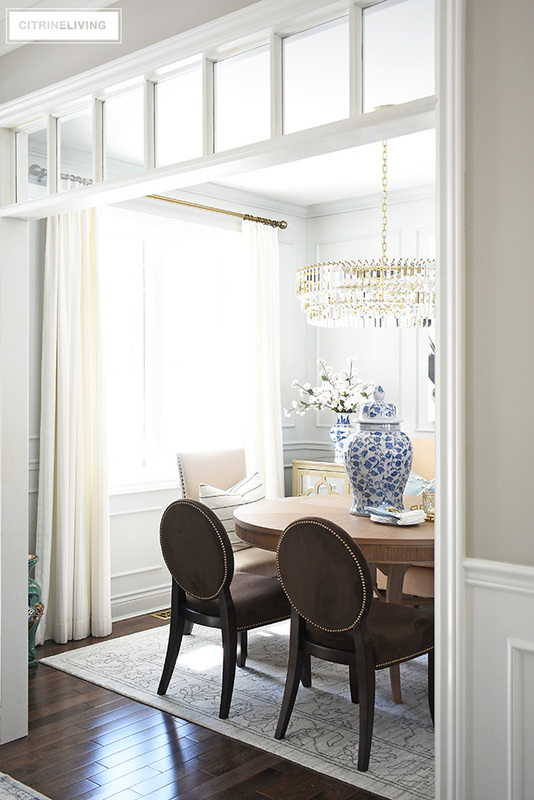 If you’ve been reading with me for a while, you’ll remember our recent dining room makeover reveal (see it here), which completely transformed the look and feel of this space. I still love it and love that I have a soft, neutral palette to work with in here, which will allow me to change things up easily. I am absolutely loving light blue this season, as you may already know – last week I shared some favorite fashion pieces I’m currently coveting – click here to see them. 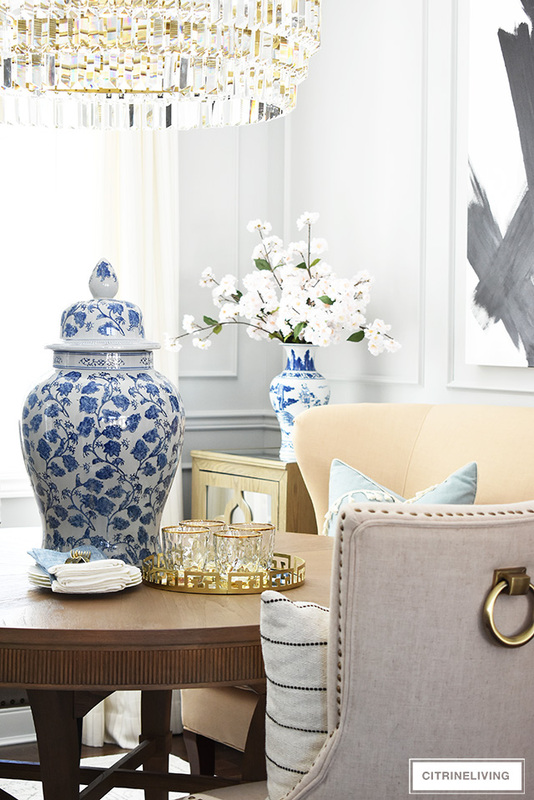 I’ve been adding touches of this soft, pretty hue throughout all of the spaces in our home this spring. 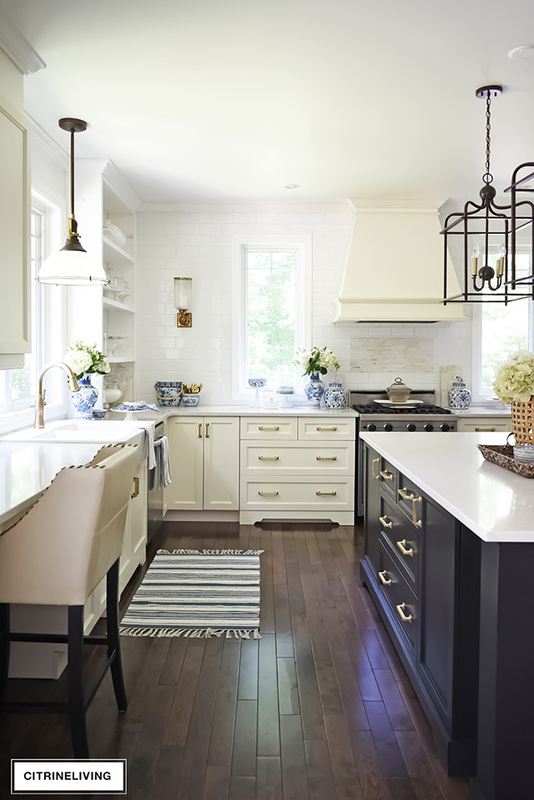 You can see even more of it in my spring kitchen and living room posts. 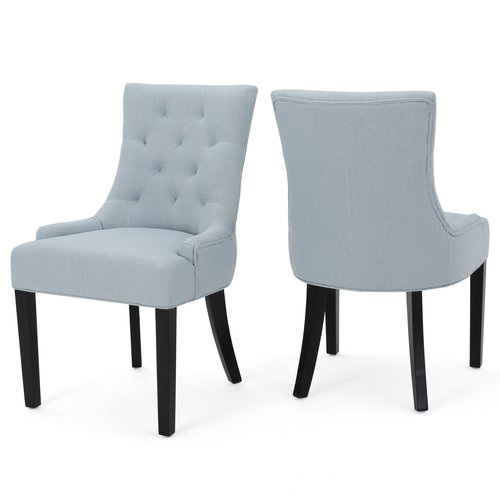 I’m loving it so much, I’ve decided to buy some new dining room chairs to replace our dark brown ones that I’ve had for about ten years. I love the brown, but I’ve been wanting something blue in here for quite a while, and these were a crazy deal I couldn’t pass up. Cross your fingers for me that they look as good as I’m hoping they will! 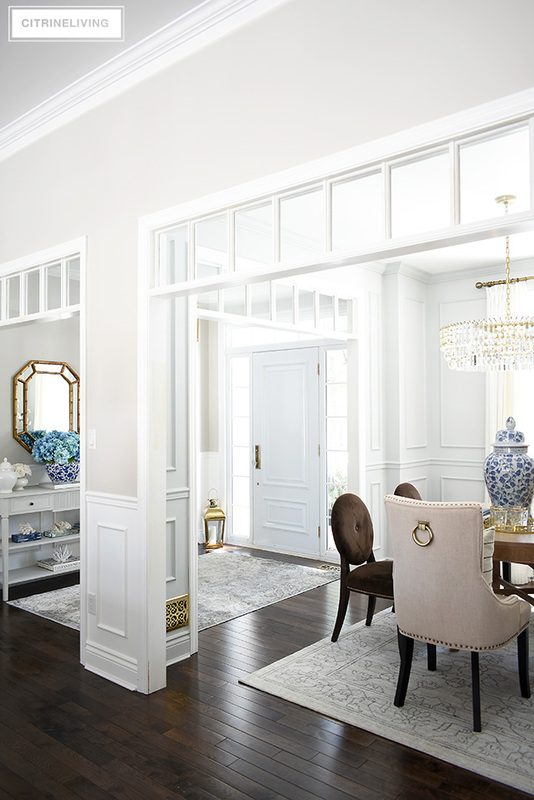 I think they’ll provide the perfect dose of soft color to this very neutral space. Click here to see them (they come in a ton of other colors as well), or click on the image below. 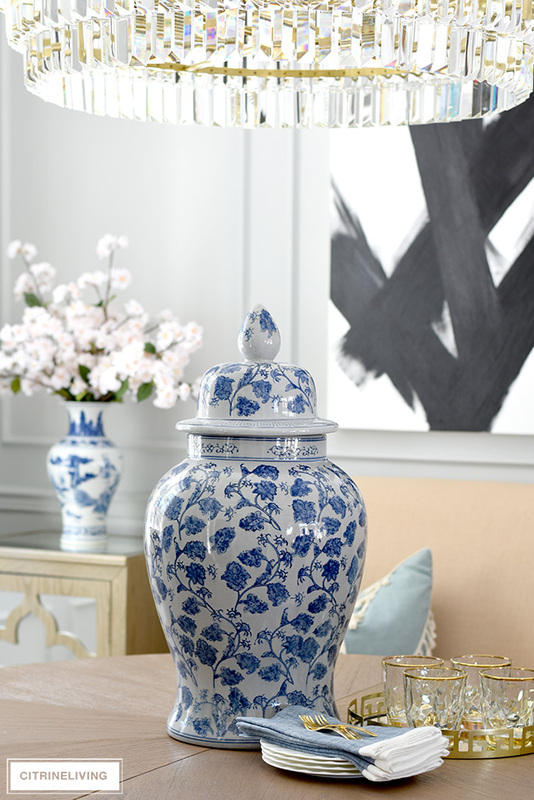 My oversized blue and white ginger jar set on the table, draws your eye right into the room from all angles of our open concept home, and also sets the tone for my spring touches in here. I styled the table using my blue napkins, brass dessert forks, along with my gold greek key tray and gold glassware to echo my blue, white and brass color palette you see throughout our home. 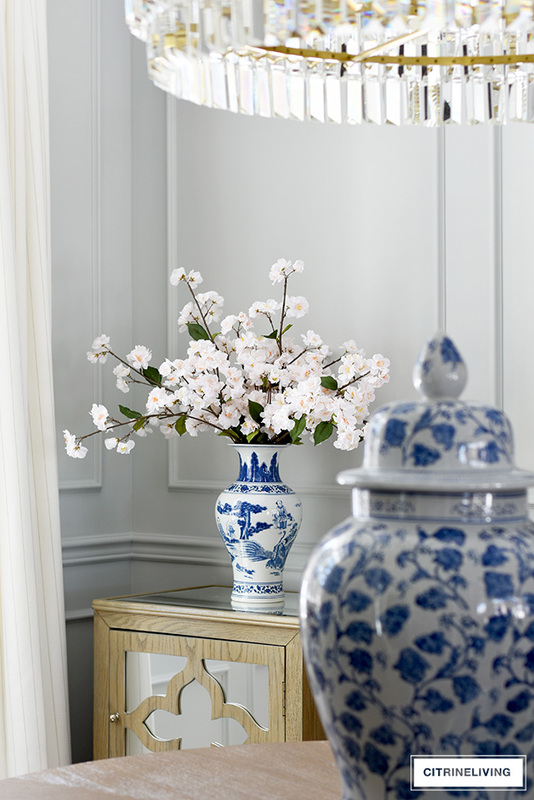 These faux blossoms were a fabulous Michael’s find and I love their color – a cross between white and the softest pink imaginable. 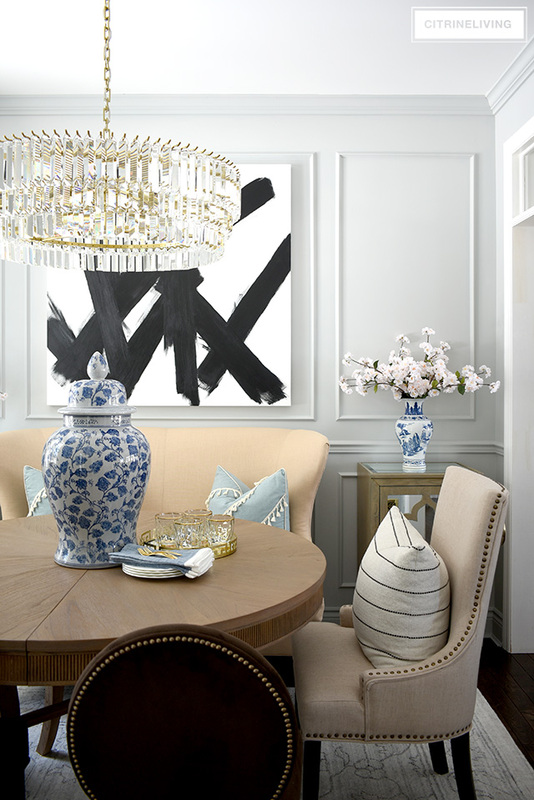 I have three branches in each vase, flanking my black and white graphic abstract artwork – I love the juxtaposition of masculine and feminine that it creates. I used my soft blue pillows with tassels on the settee to reinforce my color palette, and I kept my black and white striped pillows on the captain’s chairs to echo my artwork also. Say hi to Oscar! If you’ve never seen him before, he’s our bunny. He is a lionhead and he is the fluffiest thing ever! He pops into my photoshoots and likes to photobomb my shots every once in a while haha. Isn’t he so cute? Those blue chairs in are going to be gorgeous in here – I’m crossing my fingers their scale will work. They’re about the same height as these brown ones, so they should be fine. I think they’ll be a fabulous addition to this space, and will also visually enlarge the room. This is quite a small space, only 9 x 10 feet, so creating as much ‘visual breathing room’ as possible is a must. Simple decorating is what I’m all about! 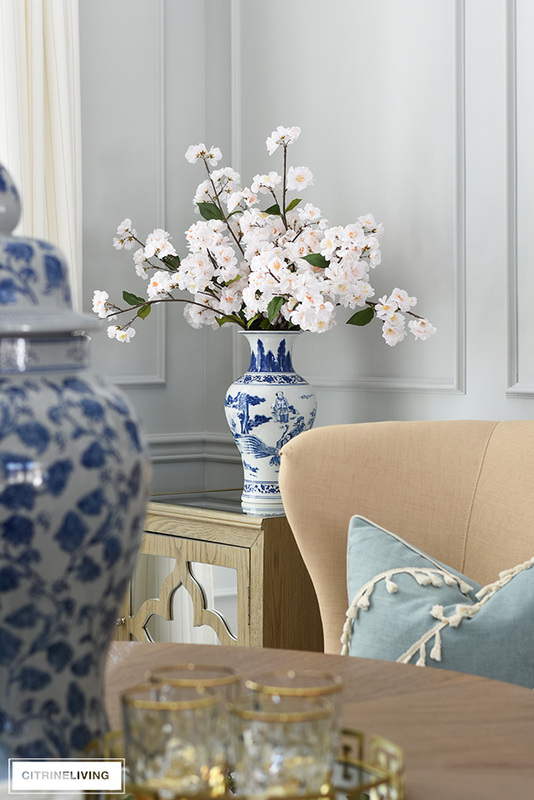 There’s no need to break the bank or give yourself a headache in the process when you’re decorating for a new season. 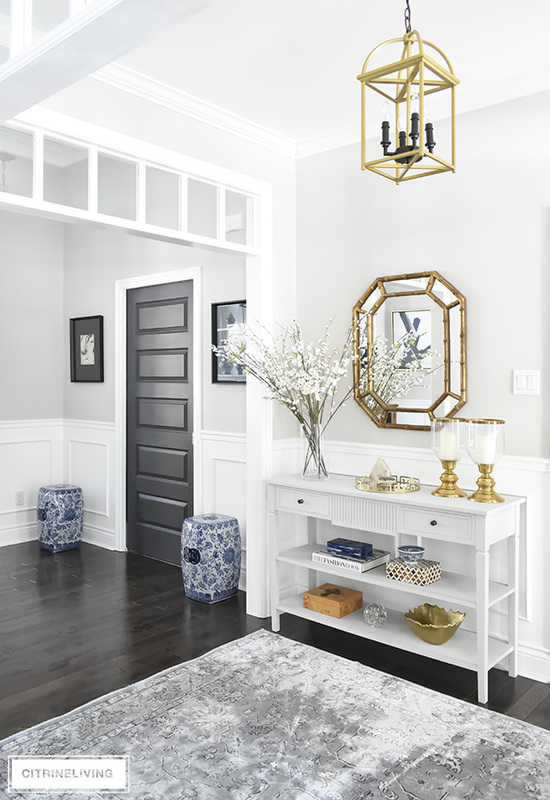 Focus on a few, key ideas – mine was playing up our existing blue and brass palette, and introducing the lighter blue tones throughout, as well as using some new faux florals. Stay tuned for an update when our chairs arrive! I’ll be back with an update post! You can also catch it all if you follow my on Instagram too, where I’ll share their arrival and an update in my stories as well! 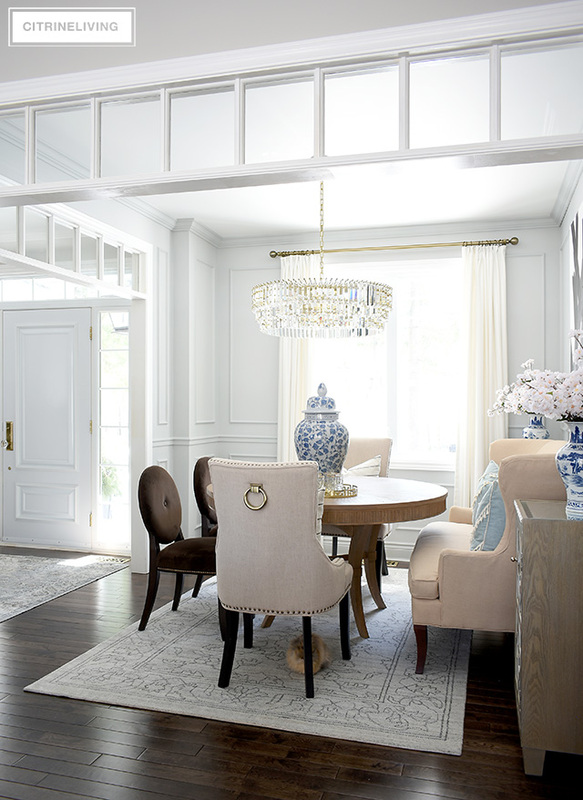 Your dining room looks fab! Not a fan of the settee or any type of bench at a table for dining. Plus, it looks very tight in that space. 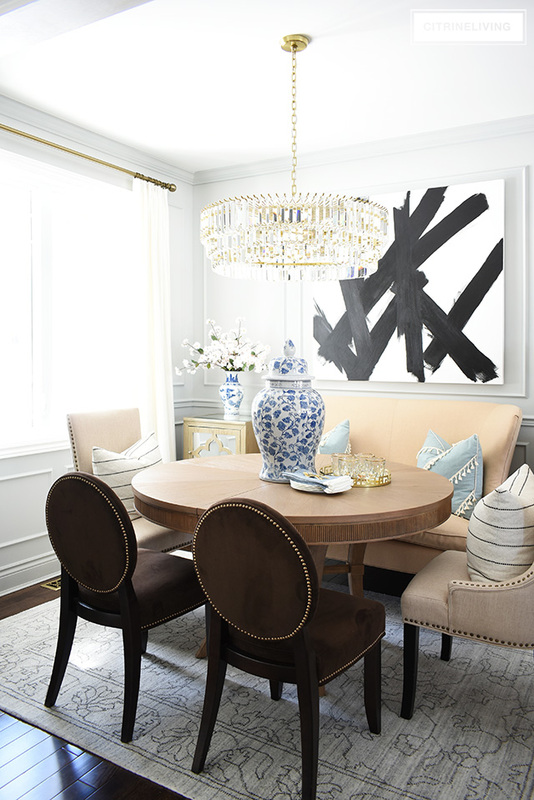 I would use the new blue chairs around the entire table for uniformity and to open the space. Love your color scheme! You have impeccable taste! I really enjoy your blog. I am intrigued by the gold tray with glasses on it. Is it a design on the edge or words in Arabic or Hebrew ? It’s actaully a greek key design, I love it! I am curious about the size of your room. It feels almost the same as the room I am working with in our home. Never considered using a settee and LOVE the cozy yet sophisticated look! Our problem is fitting 6 people and not have chairs all over the place.. the settee is a fantastic idea. My room is not open like ours, but is a room off of the narrow hallway that leads to the kitchen/living room. We live in a narrow yet long home. Beautiful! Thank you so much Amanda! This room is tight! It’s only 9 x 10 feet so the settee actually works great for us in here. You should definitely consider it!! Thanks for reading!